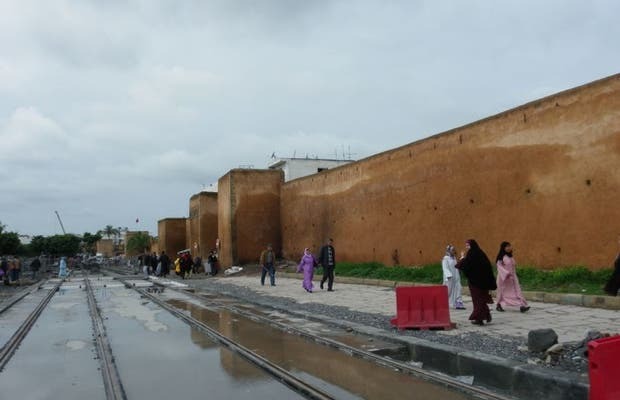 The walls of Rabat encircle and protect the Medina, the historic center of the city. If you decide to take a train there, go down Mohamed V Avenue, past the central post office, and you'll be at the walls in no time. You can see that they're building the first metro line in Morocco, which is a huge project that will connect Rabat Salé Bou Regreg across the river. The doors each have a different name, and were excavated gradually with the increase in traffic and the population. The first wall dates back to the Almohad dynasty in the late 12th century. It measures more than eight feet high and two feet deep. The walls of Sale surround the medina, the old town. They have been partially renovated, as the first city wall was built in the twelfth century. There are actually several different walls, corresponding to various expansions of the city. If you continue in the direction of the river, you'll find the Sale fishermen's cemetery, which is worth visiting. Nearby is the city's main mosque, with a small central park. The walls served as defence in medieval times, when the coast suffered invasions by Europeans. The place was then a strategic point in the commercial road leading to Fez and Meknes.